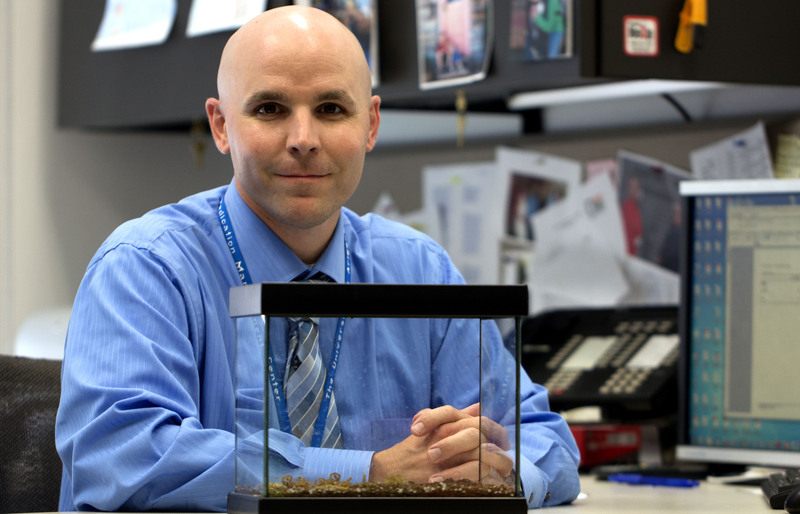 Keith Boesen, PharmD, Director of the Arizona Poison and Drug Information Center sits at his desk with a terrarium of Arizona bark scorpions on April 15, 2014. Boesen manages the day-to-day operations of the poison center. Photograph by Susan E. Swanberg. Keith Boesen smiles as he walks over to a terrarium filled with a dozen or more small, straw-colored scorpions. He opens the top, reaches in and deftly captures Arizona’s most venomous scorpion by the telson or tail. The creature wriggles a bit, then settles down comfortably on the back of Boesen’s left hand.